The map above is based on the base map for the DeLorme Ohio Atlas. While you do not need to have a DeLorme Atlas to use these map pages, they may be easier to use if you do have one. In 2004, Haicoole unveiled the California DeLorme Challenge cache. This popular challenge cache has since been repeated in many other states. TeamDotOne thought that we should join in the fun! The DeLorme Atlas & Gazetteer is published for all 50 states. These maps are a favorite among travelers and outdoors enthusiasts, and are available at many locations, including online directly from DeLorme. 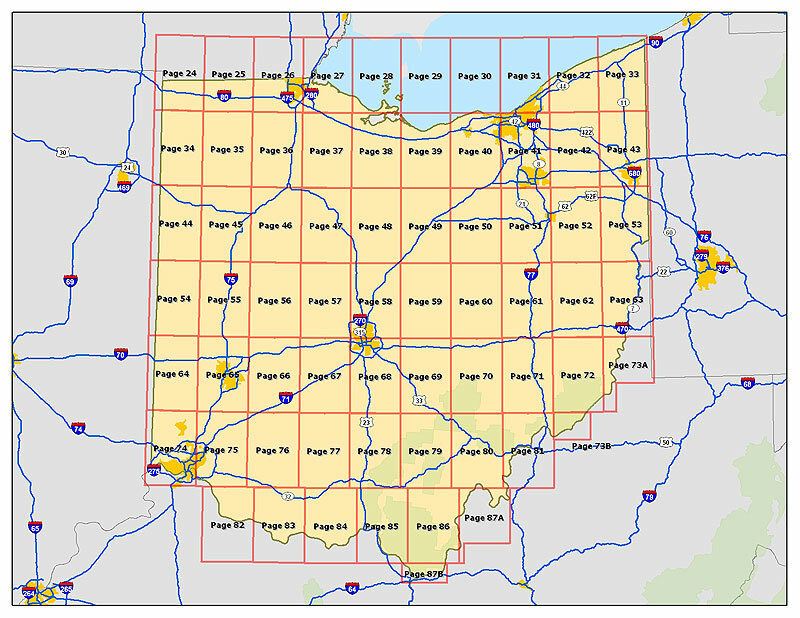 The goal of this cache is simple: to find a cache on each and every page of the Ohio State DeLorme Atlas & Gazetteer. The image above shows the geographical extents of each of the pages of the Ohio DeLorme Atlas & Gazetteer. The final cache coordinates can be obtained by successfully finding a cache on each page of the Atlas. In order to claim this cache, you must first let us know which caches you found to meet the requirements for each Atlas page. See details below. As mentioned above, the posted coordinates are not the actual coordinates for the cache. The physical cache may actually be quite some distance from these coordinates! The terrain rating and attributes apply to the final cache location, and more details will be provided when you become eligible to seek the final cache. Generally accepted rules, guidelines and conditions for logging a cache find apply. These must be bona fide caches listed on Geocaching.com that you have personally (physically) found and logged. We have debated long and hard about allowing you to count finds prior to the issuing of this challenge vs. starting everyone with a clean slate, allowing only finds after the date the cache is published. We suspect counting prior finds means several people are very near to meeting or completing the challenge. Completing a DeLorme Challenge is a mark of a home state caching honor rather than a competition to do it first. To make the challenge fair to all, caches found prior to the creation of the Ohio DeLorme Challenge will NOT be counted, even if they meet all other Challenge requirements. On pages that you can verify that you have previously found all caches, you may fulfill the requirement by setting a cache. Remember that all caches must meet Groundspeak guidelines, including not setting vacation caches that cannot be maintained. This is the only case where hides will be allowed to fulfill the challenge requirements. For Ohio DeLorme Atlas pages that include space not located in Ohio, only caches in the Ohio portion count. We will go off of the posted coordinates for a cache (including multicaches and puzzles) when determining in which state or page a given cache falls. Atlas page 29 is all over Lake Erie. You do not need to find caches on this page. Thanks to KEWAH for posting a correction for page 29 "Technically, there IS a cache on page 29. It's KIH2O (GCVKBK), out near Kelley Island," and we received another correction from HercJerk stating that "I did notice there are now three other caches on the Lake Erie page 29. They are GC1JGD2, GC1JC1G, and GC8A3A," however we are still not requiring this page to be completed but feel free to grab that cache if you would like. Whenever there is a cache shown on two different pages, these caches may be counted for only ONE of the pages. Pages 73 and 87 have two separate maps to cover little sections of Ohio. You must log a cache in each of these pages (e.g. 73A and 73B). While the various editions and versions of the DeLorme Atlas do not seem to have changed much in terms of page boundaries, the image above derived from the information in the cache owner's copy (Seventh Edition, © 2004) will be considered definitive. When in doubt, ask. We can discuss it or even seek guidance from others, but the final decision rests with the cache owners. Many thanks go out to Haicoole for the original idea for this cache and to the owners of other DeLorme Challenge caches, especially PA Reviewer's Pennsylvania and Moun10Bike's Washington version, from which we have borrowed liberally. To help you figure out which caches are on which map pages, we have the following files available. Many thanks go out to Mount10Bike for graciously creating and supplying these files for use by the challengers. The files have lines showing the borders of the Atlas pages. If you develop a similar file for a different mapping software format, send it to us and we will host that for everyone else's benefit as well. We encourage everyone to make their DeLorme Challenge bookmark lists "public" and "shared," so that everyone can see how other geocachers are coming along. Tip: Include a bookmark to this cache page on your list, and then everyone's lists can be accessed from right here. We also ask that you think of the *best* cache that you found on each page of the Atlas, for inclusion on your DeLorme Challenge bookmark list. That way, everyone will see how hard you worked to complete the challenge, and we will have a very nice compiled list of Ohio's best caches. This is just a suggestion, not a requirement. If the only cache you found on an Atlas page is a micro at a highway rest stop, it's still eligible. Those accepting the DeLorme Challenge are encouraged to post notes here on the cache page to let everyone know they are working on it, and to keep us informed of their progress. GOOD LUCK, AND HAVE FUN! Don't forget to work on The Great 88 Counties of Ohio Challenge at the same time!